Spring weather arrived early this year in many parts of the United States. Our warm winter followed by record high March temperatures triggered an early bloom for the many plants and trees that release pollen. As a result, allergy season was off and running ahead of schedule. Pollen is a fine powdery substance that is part of a flowering plant’s reproductive process. It is also a type of histamine that causes seasonal allergic rhinitis, also known as hay-fever. The American College of Allergy, Asthma and Immunology reports that roughly thirty-five million people suffer from seasonal allergies across this country. Allergy victims even have a difficult time in the urban environment of New York City, as street trees line almost every block. The city’s ubiquitous Norway Maples and London Planes are both major pollen producers. According the National Allergy Bureau, yesterday’s concentration of tree pollen in NYC was ranked as “high”. The early start to allergy season this year does not necessarily mean an early end. Doctors say that even after tree pollen production slows down, grass and ragweed pollens can cause reactions for allergy sufferers until the first frost of next winter. After weeks of summer-like conditions, New Yorkers woke up this morning to temperatures below freezing. 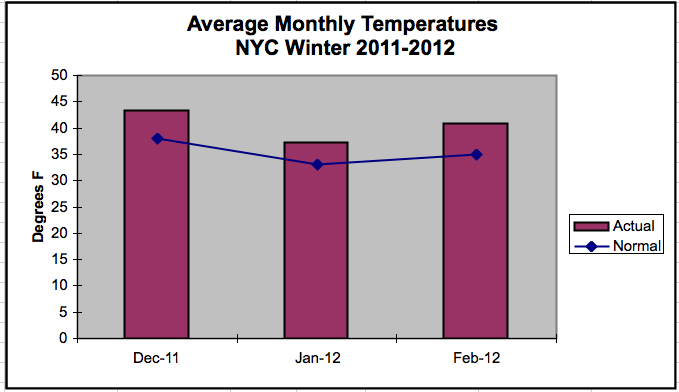 This cold snap is a reminder that what goes up must come down, especially when the calendar still reads March. The city reached a high of 54°F early yesterday and then saw the temperature drop throughout the afternoon. The dramatic cool down was accompanied by a strong north wind with gusts of 43-mph recorded in Central Park. The wind chill made it feel like it was in the 30’s. This frosty change is a huge departure from the record highs we saw only a few days ago. Last week, on the first day of spring, we had a high temperature of 73°F and a low of 55°F. Our normal high for this time of year is 53°F. This plunge in temperature, as jarring as it may feel, has brought us back to average March conditions. Local forecasters, however, are expecting a brief warm-up followed by a return to more seasonable temperatures later this week. The phrase, winter warmth, may seem like an oxymoron, but it was the theme of this past season across much of the U.S. Nationally, it was the fourth warmest winter on record. Locally, in New York City, the season ranked as our second warmest ever with an average temperature of 40.5°F in Central Park. A highlight of this meteorological winter was the city’s warmest February on record, which registered an average temperature 5.9°F above normal. These mild temperatures, in turn, meant very little snowfall. Including the pre-season snowstorm at the end of October, the city only saw 7.4 inches of snow, which is 13.5 inches below normal. Record warm spring temperatures are now following our unseasonably mild winter. Today is the Vernal Equinox, the first day of spring in the northern hemisphere. The new season officially began at 5:14 UTC, which is 1:14 A.M. Eastern Standard Time. Astronomical seasons are the result of the tilt of the Earth’s axis, a 23.5-degree angle. Today, as spring begins, the Earth’s axis is tilted neither toward nor away from the sun. As a result, we receive approximately equal hours of day and night. The vernal equinox usually marks the end of winter’s chill and the gradual return of warmth. Following our fourth warmest winter on record, however, spring conditions are already in full bloom across many parts of United States. Winter seems to be going out like a lamb in the northeastern United States. Hiking rather then skiing, therefore, seemed appropriate on the last weekend of this record warm season. 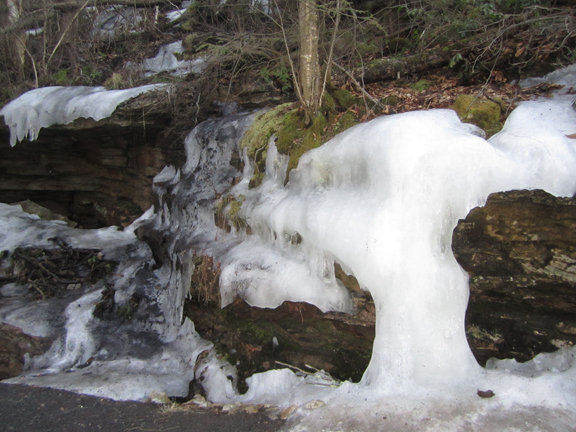 I was surprised, however, to still find ice along some of the trails in Lake Minnewaska State Park Preserve. Below is a photo of the remnants of the season. Record Warm Winter in the U.S.
It’s official! This was one of the warmest winters ever in the United States. According to NOAA, this meteorological winter (December-February) was the fourth warmest on record in the lower forty-eight. Registering an average temperature of 36.8°F, the country was 4°F above its long-term average. Scientists say that a number of factors played a part in producing this unseasonable warmth. To begin with, the Jet Stream, the boundary between warm southern air and cold arctic air, stayed well to the north this winter. As a result, mild conditions dominated the season and most of the country received below average snowfall. 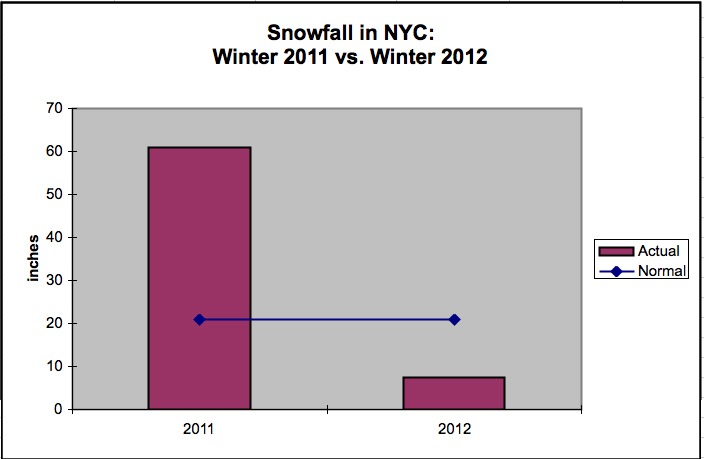 In fact, it was our third smallest winter snow cover in forty-six years of satellite record keeping. Without snow to reflect the sun’s rays, the exposed ground absorbed solar energy, helping to perpetuate the warm conditions. Two other significant factors in this winter’s story are La Nina and the North Atlantic Oscillation (NAO). These powerful climate systems influence the shape and path of the Jet Stream. La Nina, part of the larger El Nino Southern Oscillation (ENSO), brings cooler than normal water to the eastern Pacific Ocean. As a result, high pressure builds over the cool water and pushes the Jet Stream northward. NAO, the southern branch of the larger Arctic Oscillation, runs in positive and negative phases, depending on the pressure differences between Iceland and the Azores. A positive phase, like the one that dominated this winter, promotes a fairly straight path for the Jet Stream. It also brings warmer than normal conditions to the eastern two-thirds of the U.S. Given these constraints, the Jet Stream only managed to dip south a few times this season. When it did, we were abruptly reminded that it was, in fact, still winter. Those few cold blasts, however, never lasted very long. On the whole, it felt like a year without a winter. The temperature reached 71°F in New York City yesterday afternoon. That is 24°F above normal. I had to remind myself that it is still, technically, winter. Overnight, however, a cold front moved through, bringing temperatures back to more seasonable levels. These relatively cool conditions will not last long, though. The forecast is calling for a return to above average temperatures in the mid-60’s by early next week. The infamous yo-yo temperatures of March seem to be in full swing. 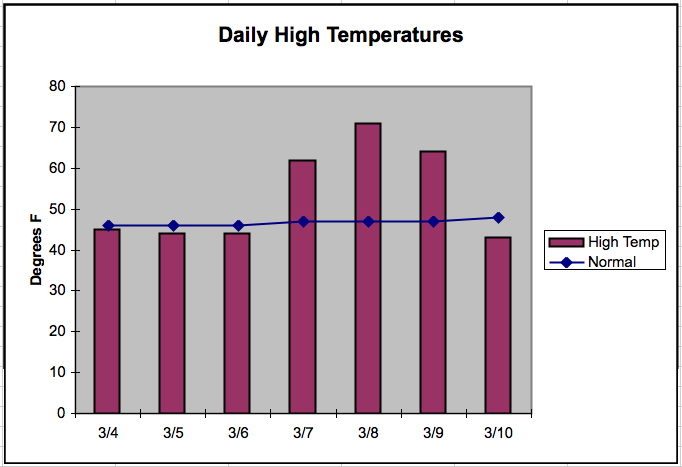 Note: Data for 3/10 is based on forecast temperature. 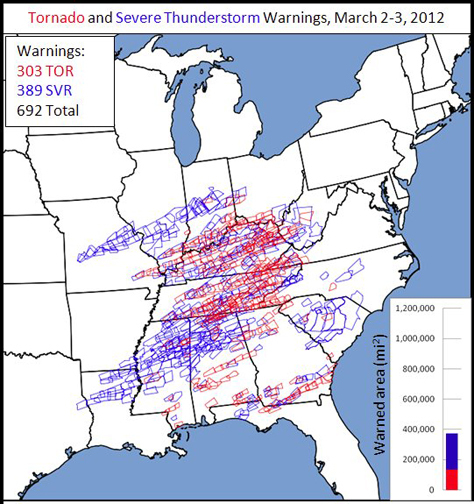 Tornadoes are nature’s most violent storms. They damage or destroy everything in their path, including weather equipment. 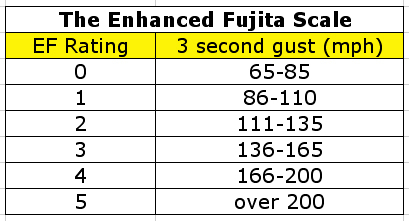 Therefore, in order to gauge the strength of a tornado, experts use the Enhanced Fujita Scale. It infers wind speeds from the damage left in the wake of a storm. Dr. Ted Fujita, a severe weather research scientist at the University of Chicago, developed the original Fujita scale in 1971. The National Weather Service used it from 1973 until 2007, when they adopted the Enhanced Fujita scale. A commission of meteorologists and structural engineers formulated the new model. It maintains the original scale’s six categories, but refines their wind speeds to reflect differences in construction quality and improved damage survey techniques. The different categories, EF-0 through EF-5 represent increasing wind speeds and escalating degrees of damage.